Damascus: “It’s about time…” snapped prominent Kuwaiti writer Fouad Hashem, referring to yesterday’s decision to blacklist Esmail Haniyah, head of Hamas and former prime minister of Gaza. Speaking to Gulf News, Hashem said: “They should have done it a long time ago,” especially after Haniyah publicly hailed Osama Bin Laden at the time of his death in mid-2011. On Wednesday Haniyah’s name was blacklisted along with three terrorist organisations, HASM and Liwa Al Thawra of Egypt, and Harakat Al Sabireen of Palestine. The first two are proxies of Qatar, wanted as “terrorist organisations” by the Egyptian Government, while Harakat Al Sabireen is a well-known agent of the Iranian regime, headed by a former commander of Islamic Jihad. Hamas itself has been on the State Department’s “terrorist list” since October 1997. The designation of Esmail Haniyah as a “wanted” terrorist is no surprise, given his history with fanatic Islamist militants. The real news, however, is the haunting Qatari silence over what just happened, given that Doha had sheltered him from such a designation for the past 10 years. Qatari authorities frequently praised him as a “resistance leader,” giving him regular and open access to the studios of Al Jazeera TV. On Wednesday, the controversial channel gave passing mention to his terrorist designation, reporting Hamas’ official condemnation of the US move with no input from Qatari authorities. Seemingly gone was its previous endorsement of Harakat Al Sabireen and the two Egyptian terrorist groups, although Al Jazeera had frequently tried sugar-coating their military activities, even after they killed an Egyptian police officer in 2016 and tried to assassinate former Egyptian Mufti Ali Jumaa. Back then, Al Jazeera said: “Although it carries arms, nothing proves HASM’s links to armed terrorist groups” claiming that their actions were in direct response to President Abdul Fattah Al Sisi’s coup against the Muslim Brotherhood back in 2013. Making Qatari silence all the more suspicious is the presence of a senior Qatari delegation in Washington DC, headed by Foreign Minister Sheikh Khalid Al Attiyah, on the very same day that the Haniyah verdict was made. Their aim is mainly to discuss counter-terrorism—a goal that requires confidence building measures on behalf of the Qataris. Most of the region’s top terrorist organisations, after all, are either based in Doha or being funded by Qatar. This applies to the Egyptian Brotherhood, Hamas, and Jabhat Al Nusra, the Al Qaida branch in Syria, now known as Hayat Tahrir Al Sham. Striking at Esmail Haniyah, after years of neglect by the US State Department, might reflect shifting priorities in Qatar. Doha might finally be parting ways with its old ally, seeing him as politically troublesome and too costly. Its alliance with Hamas and Iran have already cost the tiny state a fortune, devaluating its currency, crippling its tourism industry, and shaking its banking sector after an embargo on the Qatari government was led by Saudi Arabia earlier last summer. The US has been wanting to put Haniyah on its blacklist since 2007. The decision has been repeatedly put-off, under pressure from the Qataris. That pressure has seemingly stopped, especially after the Qatari delegation landed in Washington. Qatar has been under tremendous pressure by the US to change its behavior, and the first step in this direction would be a U-turn on Haniyah. “Qatar is an obedient servant of the United States,” he said to Gulf News, adding that Hamas has outlived its usefulness for the Israelis, who were behind its creation to weaken Yasser Arafat’s Fateh Movement, at the time of the first intifada back in 1987. 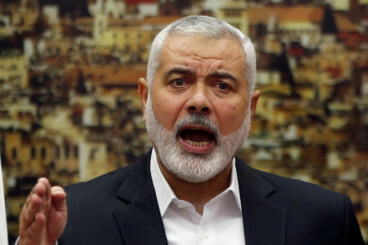 Agents are dismissed when their mission is accomplished, he noted, saying that Hamas’ mission was to spread extremism and a distorted image of Islam in Palestine, and to discredit the Palestinian National Authority (PNA). With or without Qatar, he claims, the US was preparing to get rid of it and of Haniyah. Early into the conflict, US President Donald Trump tweeted: “During my recent trip to the Middle East, I stated that there can no longer be funding of radical ideology. Leaders point to Qatar: look!” Last summer, the two countries signed a counterterrorism agreement and two weeks ago, President Trump thanked Qatar’s Emir Tamim Bin Hamad for his efforts “to counter-terrorism and extremism in all forms,” proof that US pressure was starting to bear fruit.